Summer Student Blog Post: Wrapping it up!! Well, two of the camps are finished, and it has been great fun spending all the time with the kids. Last Friday night we had our final production for the Musical Theatre showcase, and it was amazing! The kids did such an amazing job with everything, and they are all so talented. There were so many immediate costume changes, as every different song or monologue was a different costume set. They all did everything so seamlessly. The beginning of the first week was a lot of hard work and preparation for the show. We started learning new choreography for the other three group numbers, as Time Warp was already done during the last week. There was so much information given to the kids, but they all remembered everything, and I cannot believe they can remember so much information and detail. Of course we still have lots of fun with playing games. This week we learned some new fun improv games that the campers really seem to enjoy, and it is so great to watch them all go through the process of improvisation. Mike Nelson came in again to help with vocals, and this is such a bonus for us and the campers, as they get to experience vocal coaching from a different perspective. They made such progress after singing with Mike, as this really helped. Jenn Alexander and Jeannie Myles also came in this week and talked about staging and all the details in putting on a production. The campers learned a lot, and I think some of them were surprised with how much goes on behind the scenes of a production. Some of my favorite moments from camp is dancing and learning the choreography for Time Warp, and also watching everyone have so much fun with this piece. Time Warp is such a fun number to sing and dance to, and I think all of the campers really enjoyed this one. I really enjoyed watching the campers grow during the two weeks of camp. There was such a big difference between the first day and the last day, as the first day, we are just reading the parts of the scripts and brainstorming transition changes. Then by the end of two weeks, everyone has everything memorized, and all of the dance moves learned. The campers put so much hard work into this show, and it was really noticed by the final production, as everyone loved it. I have to thank Joanna and Laura for helping out with the choreography. I am so glad they were there, because I do not have hardly any dance moves to teach. It was also great to work alongside of Shelby, we both organized two wonderful camps, and it was so great to see all of the kids so happy at the camps. This week Shelby and I are cleaning the QAAW building once again, putting away costumes and props that we used for both camps. We will also be going around local businesses in Windsor, and asking for donations for the Winkie Awards Gala. As this is my last week of working with Quick As A Wink, I would like to thank everyone who helped with the camps to bring everything together. A big thank you to all of the campers I had a great time working with. You all had so much energy, and so much talent, and I am so proud of every one of you! I’d also like to thank the parents, guardians, volunteers and others who have helped in any way. Without your support, Quick As A Wink would not be able to do what we do. I am sad because I have loved working for Quick As A Wink this summer, and hopefully I will be able to do more with Quick As A Wink in the future. It’s been a great summer, thank you all for giving me the chance to learn more about theatre, learn more about myself, and be more inspired by all the amazing kids and talents. Summer Student Blog Post: Fun at Musical Theatre Camp! Only 3 more days of musical camp and things are in full swing. Our campers have been rehearsing non-stop and they’ve made some major progress. We’ve got a few more wrinkles to work out in the next few days, but I’m sure that by Friday we’ll have a fabulous show to perform for everyone. Last night, Holly and I took a trip to the building to finalize the costumes. I love searching through the building and looking at all the wonderful pieces that Quick As A Wink has. There are always so many exciting costumes that I would love to use that we simply don’t need for our show. Maybe someday down the road I’ll be able to help out with costumes for one of Quick As A Wink’s mainstage shows! Jenn Alexander and Jeannie Myles visited yesterday and Monday to help our campers learn more about what goes on behind the scenes of a production. On Monday Jenn hosted a rousing game of stage manager/producer trivia, and then yesterday, Jenn and Jeannie worked with our campers on creating set designs! There is soooo much that goes on behind the scenes of a Quick As A Wink production, and it’s important to realise how much work that we don’t see goes on, and that we should give better recognition to our producers and stage managers for how much work they do! I’ve been working hard trying to learn all the songs for our production on Friday, so I better get back to practicing! Summer Student Blog Post: Musical Theatre Camp has begun!! Musical Theatre camp has begun, and we are all having such a great time together! We began on Monday, and we have grown so much as a group, and I can already see such a difference in the campers since their first day, and we are just one week in. I cannot wait for everyone to see their final performance next week. We have soloists singing, some folks who are preparing monologues, duets, trios, and of course we have our group numbers! We have a challenging set for the campers, but they are pulling it all together, and it looks so amazing. We focused a lot this week on some choreography for Time Warp, from Rocky Horror, and they even got me dancing in this piece… and I do not dance haha. But it was so much fun! This has been my favorite part of camp thus far, I would say. Laura Gillis really did such a great job figuring out the choreography for this piece, and the campers are doing such an amazing job doing it, I’m not sure how they are able to do it all. The solo pieces are also coming along so great! Some of the kids even have the songs memorized, and they have only had their songs for a week with the script! It really is amazing what these young kids can do. It’s also amazing how the kids are able to do all the dancing and everything in this heat as well… It has been so hot in the church, so this makes days for popsicles and freezies, which the campers, and leaders, enjoy as well. We are always having fun at camp, and at this camp we are still playing lots of games. It is so fun and hilarious to see what the kids come up with. One of the favorites seem to be the game freeze, which is a fun improv game. The game starts with two people making up a scene on the spot, and at any moment, someone can say the word “freeze,” and the game pauses, and that person taps someone out, and they replace them and make up another scene on the spot. It is so great to see where the campers can take the game, and where their minds go. Another favorite game, and possibly my favorite game, is called “G’day Bruce”, and you need to say “G’day Bruce” in an Australian accent. Of course there is more to the game, but it would be too hard to explain over a blog, but trust me, it is really fun! The campers had the opportunity to try on their costumes this week, and we had a lot of fun with this. It’s always awesome to see the campers with their costumes, as then they really can get into their different characters. It has been so awesome this last week spending time with the kids, and next week is our last week already!! With our final performance on Friday, the 3rd, I would love to see the theatre packed so everyone can see the amazing talented campers perform! Summer Student Blog Post: Drama Camp! Last week was certainly a whirlwind. Holly and I spent last week at the Windsor United Church with our drama campers, rehearsing, singing, and playing games. 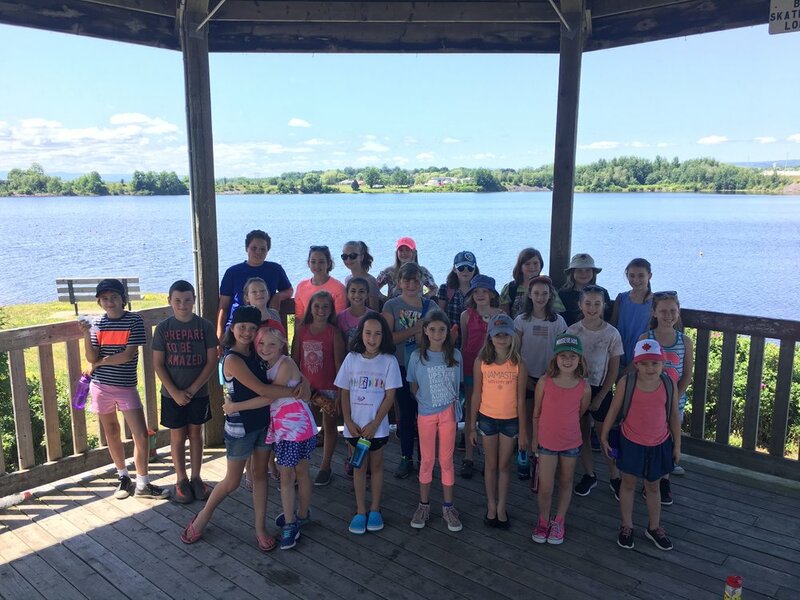 We took a nice walk down to the waterfront gazebo to enjoy the sunny weather, and our campers especially enjoyed trying on costumes for the performance. Everyone had a lot of fun rehearsing for our fabulous Friday night production. It was really hot in the church, but Jen Alexander brought us some freezies to keep everyone cooled off. It was very much appreciated after the walk back from the gazebo! We also got to make some fun crafts, like card garlands and tissue flowers. We used the painted tea cups our campers created in the tea party scene in our final performance. The tea cups really added something special to the set, making it even more silly. Our talented campers performed Alice in Wonderland on Friday night to quite the crowd at the Fountain Performing Arts Centre of King’s-Edgehill school. It’s always so nice to see the progress from when everyone arrives the first day of camp having never seen the script, to the last day where we perform for our family and friends. It’s hard to believe that it all comes together that quickly, and it really speaks to how talented and hard-working our campers really are. This week we’re on to musical camp. The first two days have been amazing. I’ve really enjoyed getting the chance to work with everyone on their songs. The show this year is filled with some of my very favourite pieces, so it’s been extra fun to work on. We’ve also played some amazing improv games. One of my favourites is freeze, where our campers have come up with some hilarious scenes. We were lucky enough to have Mike Nelson come in and work with our campers yesterday on some of their group numbers! He had them singing songs from Grease and Beauty and the Beast, and everyone sounded fantastic. Last night I also hosted the Quick As A Wink trivia night at the Spitfire Arms Pub. Our theme was music, and though there were some tricky questions, everyone had an great time. Hosting trivia nights is one of my favourite parts of my job, and I hope I can do it a few more times before the end of the summer! Summer Student Blog Post: Summer Camps Have Started!! The campers down on the water front in Windsor during their week at camp. Well, we have completed our one week theatre camp and it was so awesome! We all shared many laughs with each other while playing games, and had lots of fun making crafts. Of course, we also worked really hard to put together our show for Alice in Wonderland. All of the campers worked so hard during the week to help bring the show together. Some of my favorite moments from camp was making the tea cups for the tea party scenery in the play. All of the campers were so creative when we were painting these, so many fabulous and different colors. I also loved creating the scenes of the performances. It was so awesome to watch everything from my mind come to life after reading and studying the script. Another favorite moment was when we did the fashion show with all of our costumes on. The campers loved doing this, and it was fun to watch. We got to go for a nice walk during the week to the gazebo on the waterfront, and we played many games outside when we were there. The campers started showing a lot of progress throughout the week, and I could not believe how well the play was coming together. So many great things came from camp, but the biggest thing for me was seeing the progress form everyone at camp. We only had 5 days to put together a show, and we did it all amazingly! The show in the end was done so well, as they are all so talented and we are so proud of every single one of them. This week could not have been possible without the help of everyone. This includes the parents, the Quick As A Wink board, and Joanna and Laura. Joanna and Laura have helped Shelby and I so much with both camps and we are so grateful and appreciative for them to have been there. We truly could not have done it without them. Besides camp, I still have been hosting some of the Trivia Nights! The last week I hosted a “Back to School Theme.” We went back to school, and though some found it hard to remember their junior/senior years at school, it was quite funny to watch and see. There were categories such as history, science, health, geometry (one of my favorites), and even Driver’s ed. Remember when you were first learning how to drive, and you had to remember every rule of the road, some of these were talked about during trivia! The next two weeks we will be busy with our Musical Theatre camp, for ages 12-17. We are excited to get started, and on that note, I still have a few things to do, so I am going to get back to it! Stay tuned for more information and what we are doing this summer with Quick As A Wink! 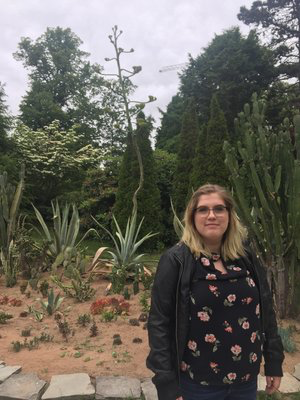 Summer Student Blog Post: So Glad to Be Back!!! My name is Shelby Marshall and I’m one of the summer students working with Quick As A Wink this summer! I worked with Quick As A Wink in 2016, and I couldn’t be happier to be back. I’m especially looking forward to Drama and Musical Theatre Camp! I’ll be writing blog posts along with my co-worker Holly to keep you updated on what I’m doing this summer! For those of you I haven’t had the pleasure of working with before, I’ll introduce myself. I’m finishing up my Masters of Arts degree from the University of Ottawa. I’ll be graduating in the fall, and heading to St. John’s to do a Masters of Music in Orchestral Conducting at Memorial. I graduated from Acadia University in 2016 with a degree in composition. My time spent in the valley sparked my interest in musical theatre and theatre direction. I’ve played in the pit band for several Quick As A Wink Shows (the Winkie Awards, You’re a Good Man Charlie Brown, and The Little Mermaid). I've also gotten to play with St. Joseph’s Stage Prophets and the Acadia Singing Theatre Ensemble. This inspired me to pursue musical direction for theatre. Someday I want to lead amazing productions like the ones I've been able to do with Quick As A Wink. I started working with Holly earlier in June, and we have been busy preparing camp. I was especially excited that I got to see everyone’s auditions a few weeks ago. Choosing scenes and songs for our Musical Theatre campers and roles for our Drama campers is one of my favourite parts of this job, and I think we found good roles for everybody. I know that the camp performances are going to be spectacular! That is all for now, but I will be writing again soon! Summer Student Blog Post: Getting Ready For Camps! Even though Seussical is over, I am still singing almost every song from the production. It was such an amazing show, and I miss it! However, there are plenty more things to do to keep me busy. The past few weeks I have been busy getting the play ready for when the kids come to camp! We have decided what to do for the play… and we have decided to do Alice In Wonderland! Shelby and I have been setting up the schedule for the One Week Theatre camp, coming up with different games to play, crafts to make, and how we can put on a great production for the final show for everyone to come and see! With a production comes a lot of preparation, including what props to use for the play, what costumes everyone is going to wear, and then we need to decide what everyone’s role will be! We did auditions for both Drama Camp and Musical Theatre Camp and they were fantastic!! Lots of kids came and showed their energy and smiles on stage. There were also so many amazing singers! Such talent from everyone- this was so great to see. I think my favorite part of the auditions was seeing the kids show their “sassy” side when one of us asked them to say a certain line. They really rocked this part! Everyone did such a great job, and everyone for the one week drama camp should have been notified by email with what their individual part will be. This past week Shelby and I have also been in the Quick As A Wink storage building looking for anything we can use for the Drama Camp and the Musical Theatre Camp. We have been finding a few things here and there, but we will still need to look for more fun things we can use. We have also been organizing the place… there are so many things stored in that little building! It is fascinating. The past two weeks I also hosted Trivia Night at the Spit Fire Arms Pub in Windsor for the first time. This was a lot of fun, and I shared many laughs with everyone. The two themes were, Everything with the Letter S, and Animals. The animals theme ended with a tie-breaker, and a member from the two teams had to make an “animal sound” as their buzz, it was hilarious. Always a fun time with everyone. Last week, myself and Shelby also helped out with the first Ghost Walk of the season! We were able to walk along with Jerome and listen to all of the amazing stories. Such a fun and spooky night. And my last note, I hope everyone had a great Canada Day Weekend, and a great first week of July. The weather has been gorgeous, a little too hot for some people, so I hope you all are wearing your sunscreen! We also have tablecards for Seussical! Have you seen any of these in one of your local restaurants? What a busy week it has been! I have been going into many schools over the past week and a half talking to students about camp. Everyone is loving the game “Whoosh”; how could they not? The classrooms I visited have been filled with imagination, joy, laughter, and fun interactions with other kids when we play this game, and these things are what camp is all about! I have also been travelling all around Hants County and Kings County putting up posters for our production of Seussical the Musical! The opening show on June 1st is just days away- it is so hard to believe that it has come so fast! I will be there for all of the performances, and I cannot wait to see everyone perform. We are starting to get ready for our summer camps! We have narrowed down a list of possible productions for the drama camp, and I have started contacting different companies to see which production will fit our camp the best. Who knows what our final decision will be for the drama production, or what pieces we will do at musical theatre camp! Stay tuned - more on this later on as we get closer to camp!